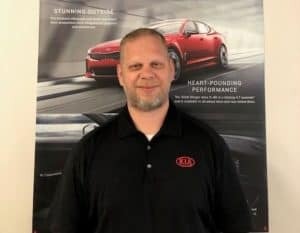 Taft is from Maryville, TN and has lived here in Chattanooga for the last 18 years. He is married and has 2 daughters. 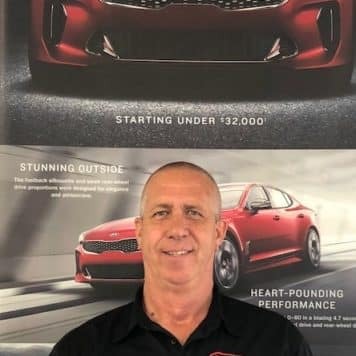 This is Taft’s 28th year in the car business. 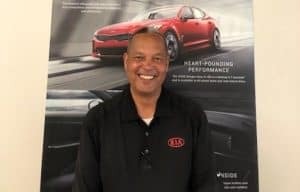 He was with Toyota and Lexus and left to come to KIA because of the great product and wanted to be with a company that was on the cutting edge of technology and stood behind its 10-year, 100,000-mile warranty. He is a member of Christ United Methodist Church. In his free time, he enjoys boating, football, spending time with his beautiful wife and family, and yelling GO VOLS! 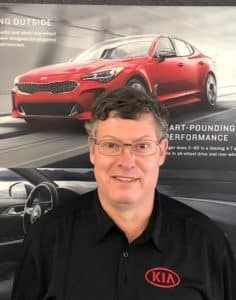 Boone has been in the car business since 1985 started with Standefer Nissan until 2007 and then Ken Hunt at Hunt Nissan until starting here with us at KIA in 2018. Boone is married with a beautiful daughter. 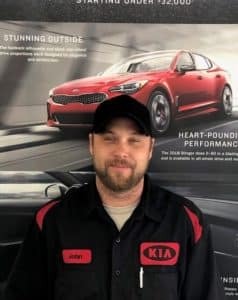 Boone enjoys the outdoors and spending time with his family. 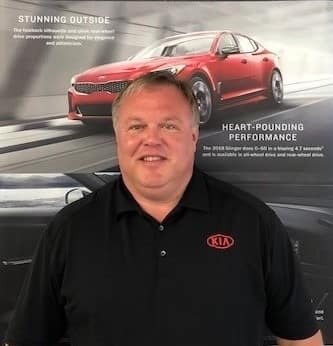 Dirk has been with KIA of Chattanooga for 9 years and counting. 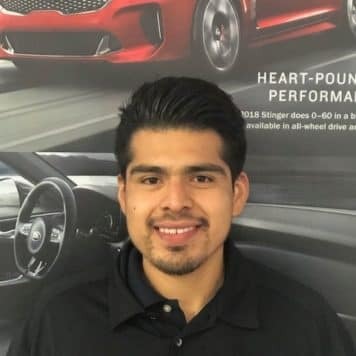 He started in Sales and has progressed to a Sales Manager position currently in our Business Development Center (BDC) team. He is married with a beautiful daughter. 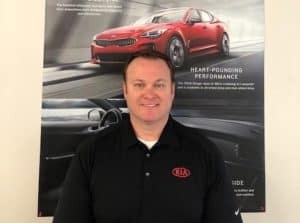 His interests outside of work include hunting, fishing, and pulling for the Crimson Tide! 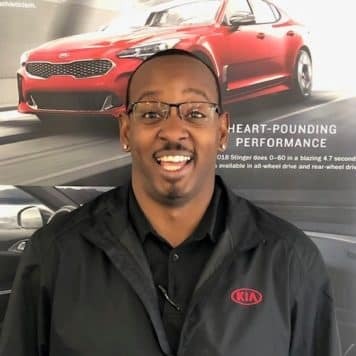 Clyde is originally from Mississippi and now resides in Dalton, GA. 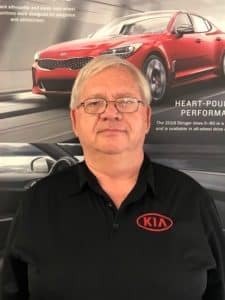 He has been in the car business for 17 years, the last 8 here at KIA. Clyde has been married for 18 years and has 2 wonderful boys. 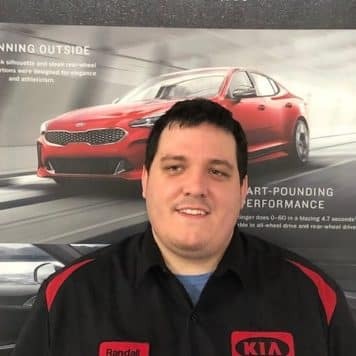 He enjoys video games and spending time with his family. He is a big fan of the “Mouse” and goes to Disney every chance he gets. 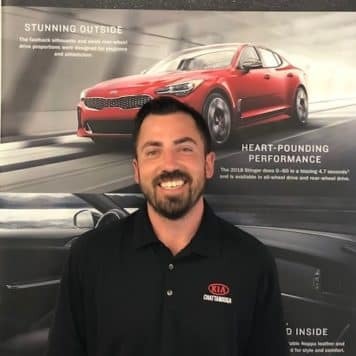 Matt grew up in Marietta, GA. He has 3 children and has been married for 10 years. 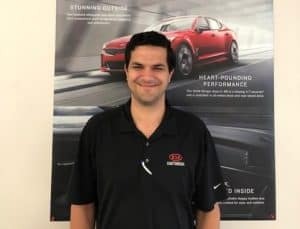 Matt has been in the car business for 5 years. 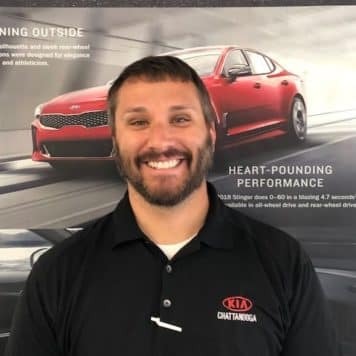 When not at work Matt is usually at the lake or the pool. 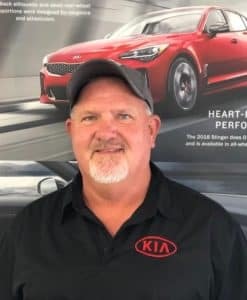 Kevin is from Richmond KY. 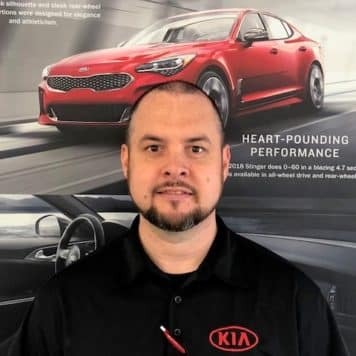 He has lived in the Chattanooga area since 2006. 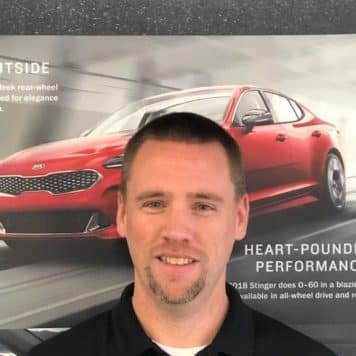 Kevin is married to his high school sweetheart and has no children but does have 3 little dogs. 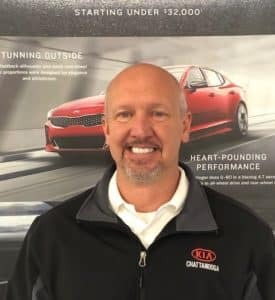 This is Kevin’s 12th year in the car business and here at KIA of Chattanooga for the past year. 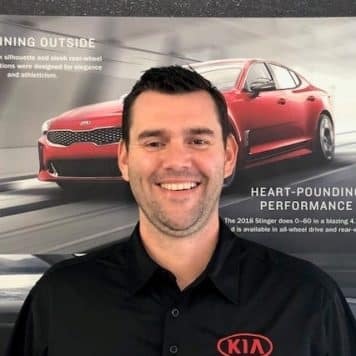 When not working Kevin is a fan of Kentucky Basketball, Green Bay Packers football and The Vegas Golden Knights NHL team. 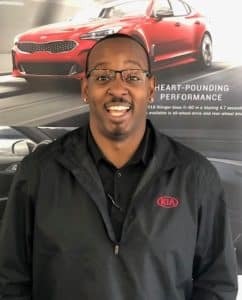 Hank is originally from Compton, CA, and moved to the Chattanooga area in 1991. 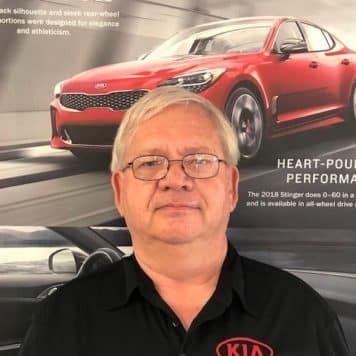 He is married, has 5 children, and 9 grandchildren. 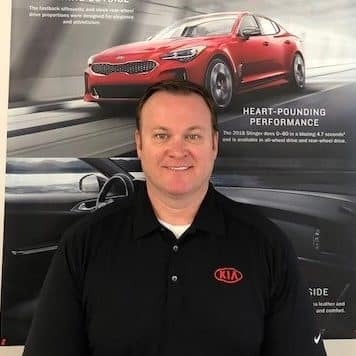 He is a veteran of the United States Air Force and attended USC. 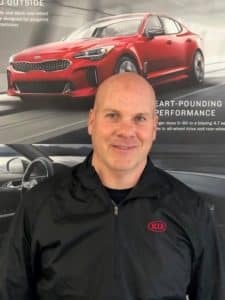 Hank has been in the car business for 18 years and thrives on making the buying process easy. 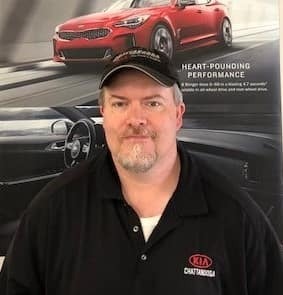 Craig is new to KIA of Chattanooga but not to the car business. 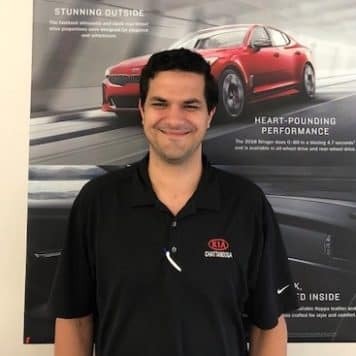 He is a true professional and understands the importance of treating his customers the way he would want to be treated. 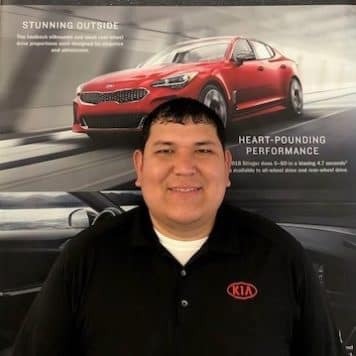 Romero is brand new to the car business, he is bilingual and we are happy to welcome to our KIA family. Sharron is originally from Sparta TN. 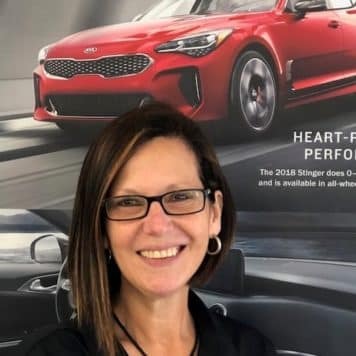 She has worked for KIA since 2017. Traveling is a passion and spending time with her family. 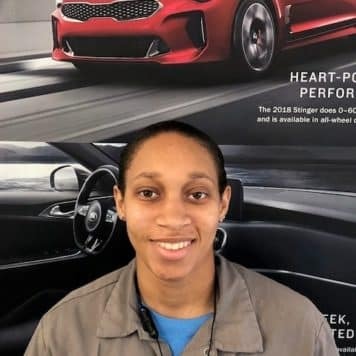 She loves the automotive industry and helping others. 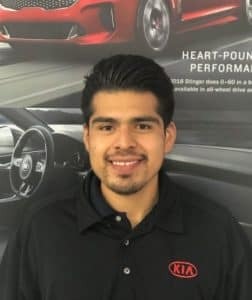 Juan is from Dalton GA. 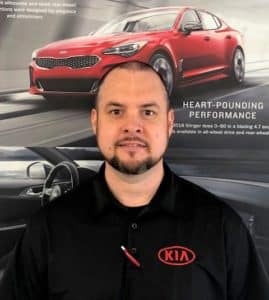 He has been in the car business 5 years the last 2 here at KIA of Chattanooga. 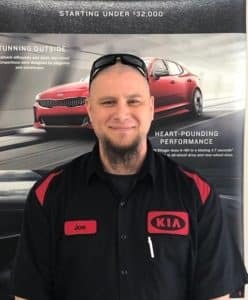 John is brand new to the car business. 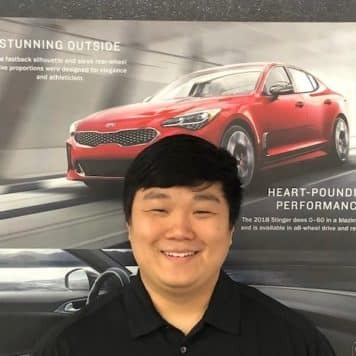 He is from South Korea and has been in states several years now. 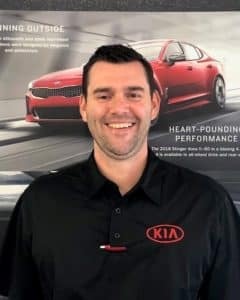 John is married and so far he likes the car business. 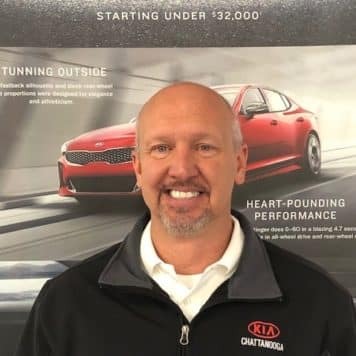 Scott is a homeowner in North Chattanooga, lives with his wife, son and rescued dogs. 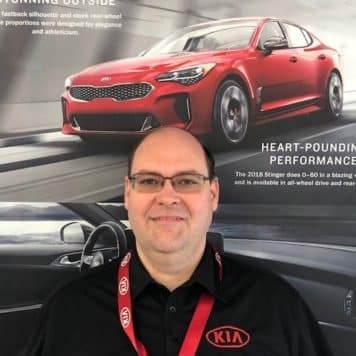 A car sales professional for over 13 years with hundreds od happy clients. 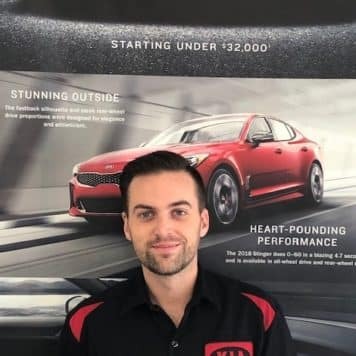 He loves working out, sports, hiking and family. 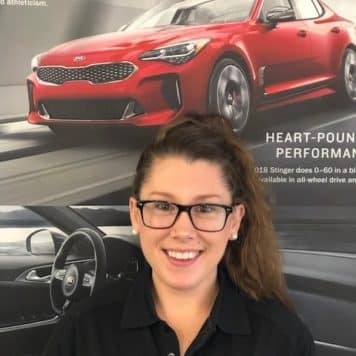 Allie is a member of the BDC Team. She is from South Korea and Argentina and speaks both Spanish and Korean. She is married and has 3 beautiful children; 2 daughters and a son. 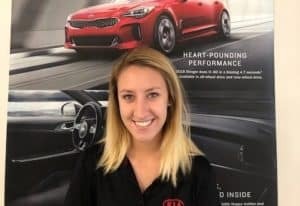 Allie has been in the car business for 5 years. 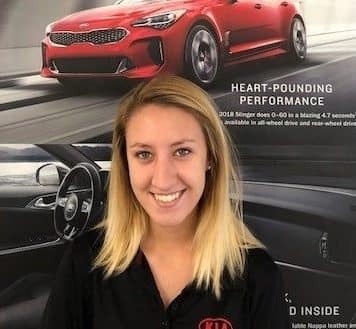 Allie enjoys watching football and spending time with her family. 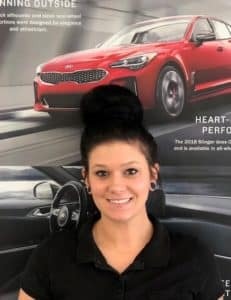 Lindsey is from Soddy Daisy, TN and just started year number two in the car business. 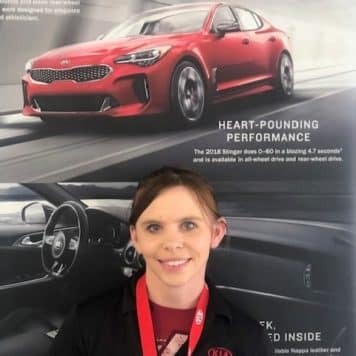 She has a great attitude and is willing to help anyone. This is her first sales position and she really enjoys meeting friendly people and learning daily how to be a better salesperson. 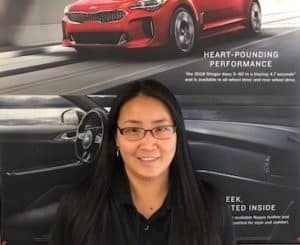 Samantha is new to the car business, this is her first dealership experience. She is from North Chattanooga and went to Red Bank high school. Samantha enjoys PC gaming and anything outdoors. Give her a call today and help her gain new customers in the car business. 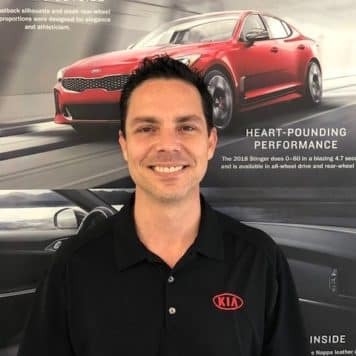 Matt is from the Soddy Daisy area and has been in the car business for the past 19 years, the last 8 were here at KIA of Chattanooga. 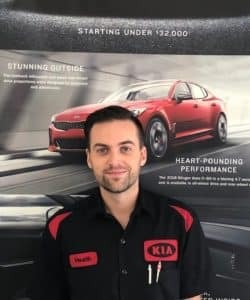 Matt is married and has 2 children. 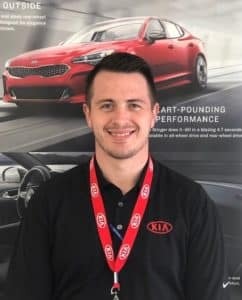 When not working he likes boating, camping and watching the Arsenal play soccer. 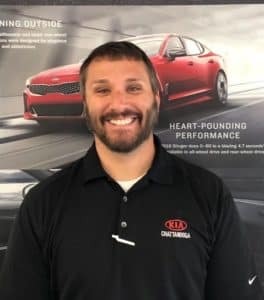 Robert is one of our service writers here at KIA of Chattanooga, he has been in the car service business for 6 years the last 5 at KIA. 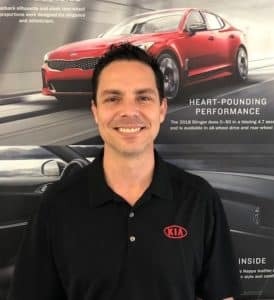 He is married and has 1 child, when not helping customers Robert is our resident pro golfer and enjoys being outdoors when ever he can be there. 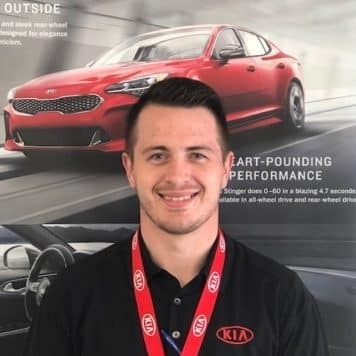 Charlie is a service writer here at KIA of Chattanooga, he is very knowledgeable, friendly and genuinely cares about all of his customers. 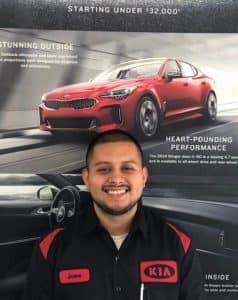 He gets many complements and people like working with him. 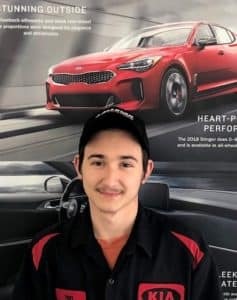 Jacob has a wonderful personality and really tries hard to provide customers with a great experience when visiting our service department. 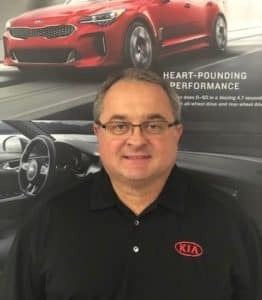 John is from Wildwood GA. and has been in the automobile repair business for 18 years, the past 9 here at KIA of Chattanooga. 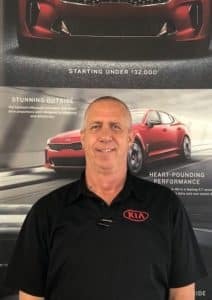 John enjoys restoring classic cars and is currently rebuilding a suicide doors Lincoln continental and a bad to the bone GT Mustang. John has 1 son and is a big fan of UGA football and the great outdoors. 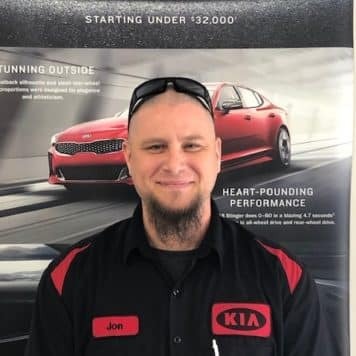 Jon is a life long resident of Ringgold GA. he is married and has no children but does have a cat and a dog. 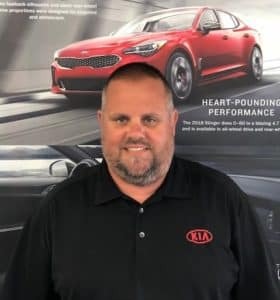 Jon has been in the automobile business for 20 years and KIA of Chattanooga for the past 9 years. 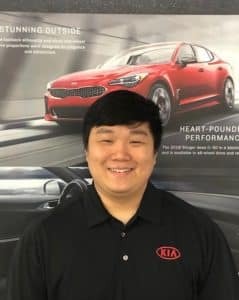 He is a big fan of the Georgia Bulldogs, enjoys shooting sports and video gaming. 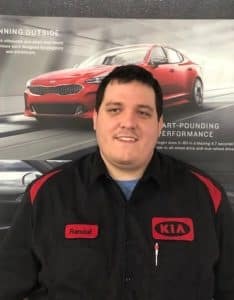 Randall is a good guy, great with a wrench and drives a fast car. 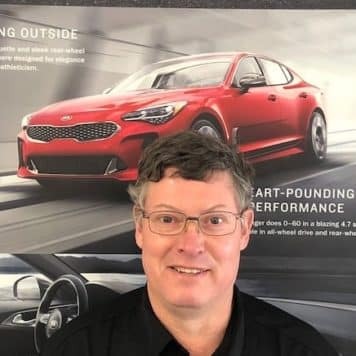 His picture really says all you need to know……. 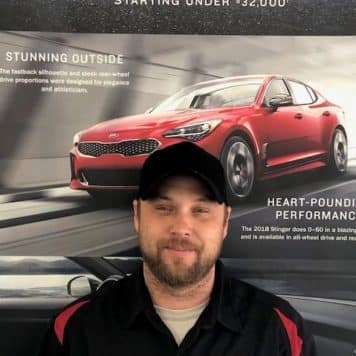 Heath is from Ringgold GA. 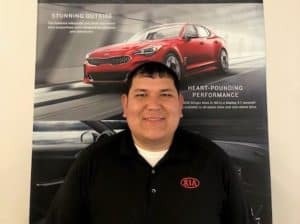 He has been a Technician in the car business for 9 years the last 4 here at KIA of Chattanooga. 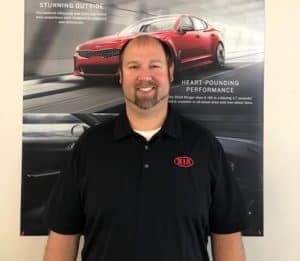 Heath enjoys riding mountain bikes and being in the great outdoors. 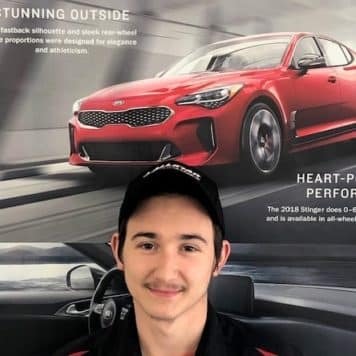 Ian is new to our shop and is training to become a certified KIA tech. 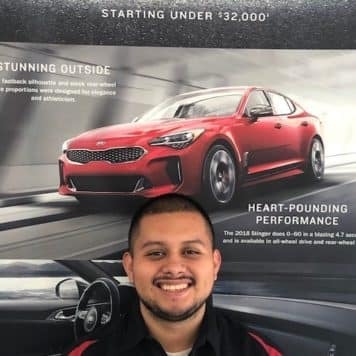 Bernard was a Army brat as a child and grew up all over the world, he was born in Germany. 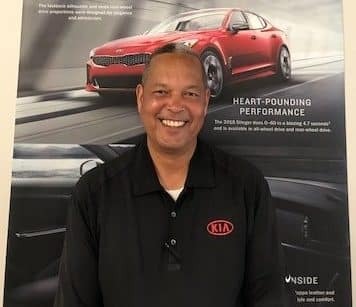 Bernard has lived in the Chattanooga area the last 25 years, He is retired now and has been with KIA of Chattanooga for 3 years as our Porter. He is married and has 1 child. Camping and being outdoors is his favorite past time. 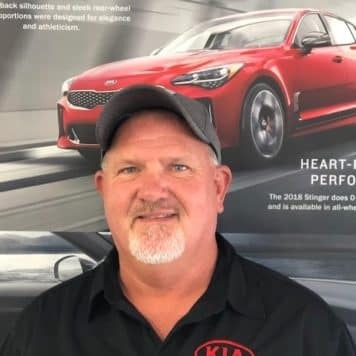 Gregg was born in Knoxville TN. 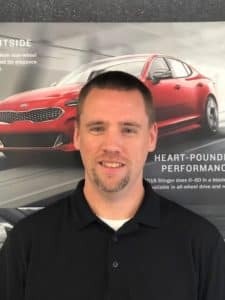 but has lived in the Chattanooga area most of his life. 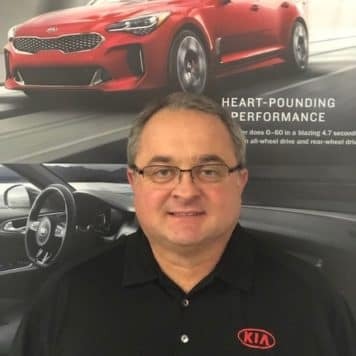 Gregg has been in the car business for 17 years and with KIA of Chattanooga the past 3. 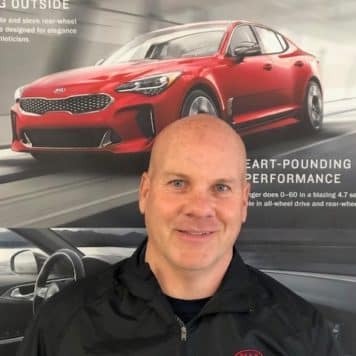 Gregg is married and has 2 boys to keep him busy, 1 is 8 the other is 5. When not working he loves college football and anything to do with the outdoors. Mike is from the big city of Soddy Daisy TN. 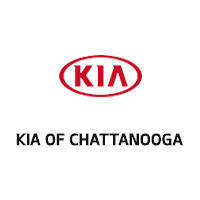 Mike has been in the automobile parts industry for the past 13 years, the last 2 with KIA of Chattanooga. 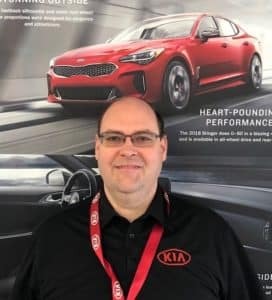 Mike is married and has 3 children. 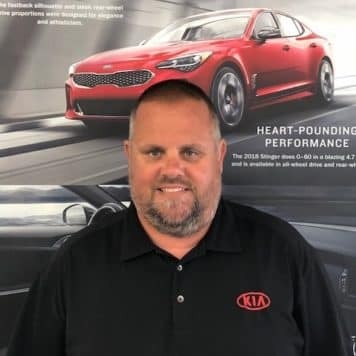 When not working selling parts he is coaching his youngest daughters softball team, which occupies most of his free time. When not at the ball fields he can usually found on the lake catching Crappie or Bass fishing. Lucas is from Hixson TN. 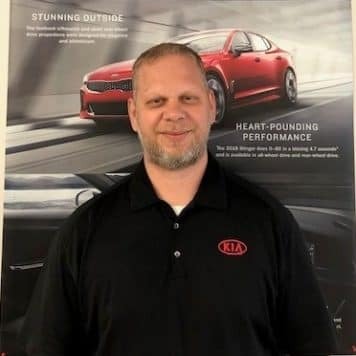 He has been with KIA of Chattanooga 2 years and is in the parts department, this is his 14th year in the automotive industry. 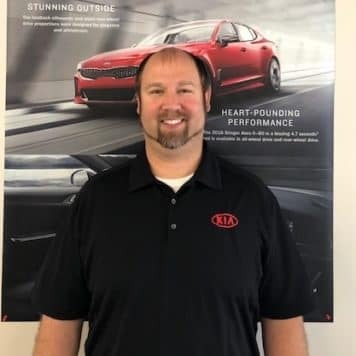 Lucas is married with 2 children and enjoys spending time with his family. In his spare time he likes to go to the drag races and shoot pool. 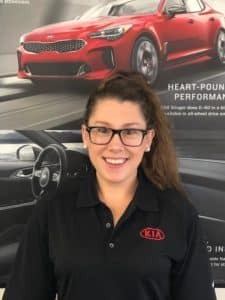 Darian has been with KIA going on 3 years, she is excellent in her profession and we are thankful to have her. TWO Words describe TOM, ROLL TIDE !!!! 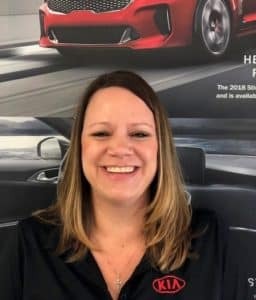 Brandi has lived in the Chattanooga area the past 23 years, she has 2 children ages 19 and 16. 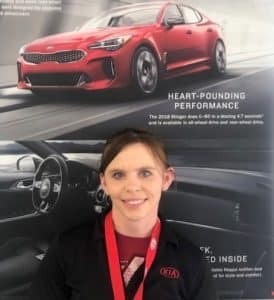 She started at KIA of Chattanooga last August and this is her first job in the car business. 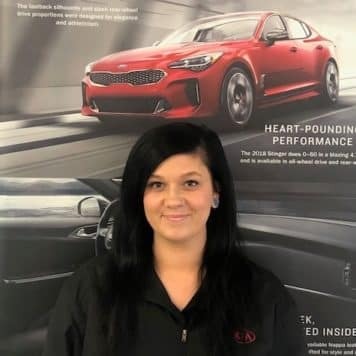 Brandi says she enjoys working with amazing people here and learns more about the business every day. She is a big fan of Star Wars and the Marvel movies. 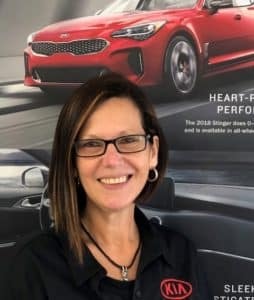 Angie is the glue that keeps KIA of Chattanooga together and going strong. She is from the great state of Alabama is a fan of the Crimson Tide. Angie has over 28 years experience in the car business, the last 6 here at KIA of Chattanooga. She is married and has 4 children. When away from here, she enjoys gardening and being on the farm. 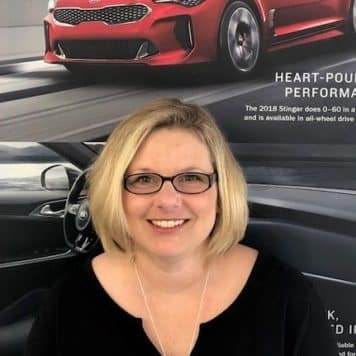 Joyce was raised in Belpre Ohio, moved to Nashville, TN. in 1982 and to Chattanooga in 1995 (she does consider herself a Tennessean). 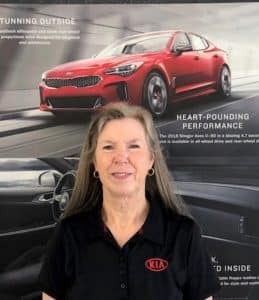 Joyce has been in the car business for 9 years, the past 4 at KIA of Chattanooga. 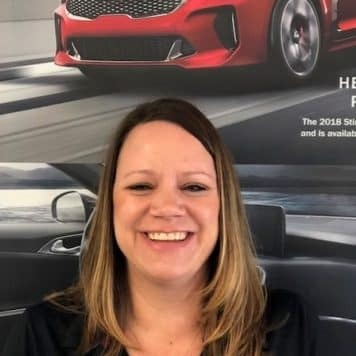 She enjoys her job and working with a great team. Joyce has 1 daughter, a son in law and a precious grandson. 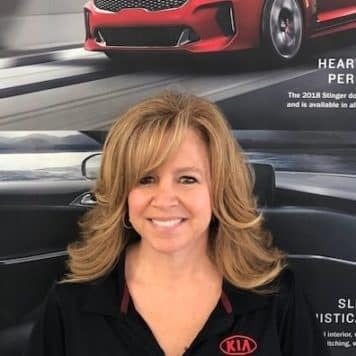 She enjoys spending time with family and friends, loves the beach and watching her grandson play baseball. Liz is from Cuba, has lived in Chattanooga the past 11 years and really enjoys the Chattanooga area. 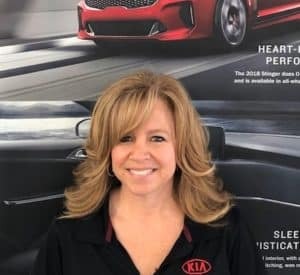 Liz enjoys photography and living life to the fullest, this is her second year in the car business. Corteney is originally from northern Illinois, and has the accent to prove it. 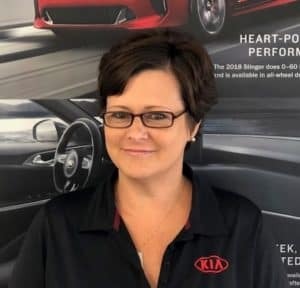 She has been in the car business for 12 years and the last 6 here at KIA of Chattanooga. Corteney enjoys water sports like paddle boarding and being in the sunshine. 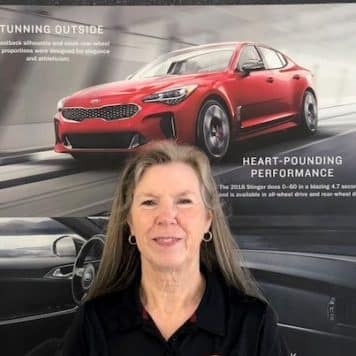 Frances is our wonderful receptionist, and so much more. 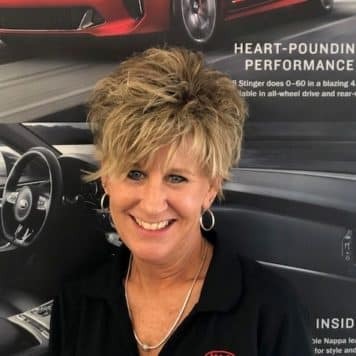 She is the warm smiling face that greets our guests as they enter the dealership. Needless to say, we would be lost without her. 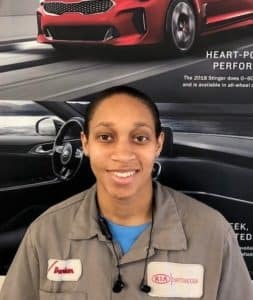 Jennifer has been in the Chattanooga area since she was 8 years old. She has 2 sons and is lucky that all her family lives in this area. 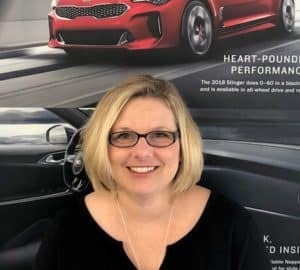 Jennifer has worked in the county school system as a Title 1 assistant for 10 years before coming to KIA 3 years ago.